Economist Gareth Morgan presented a more detailed form of his 'Big Kahuna' idea for a completely new tax and benefits system at the Fabians Seminar 'Fresh ideas for a Productive Economy' held in Parliament last week. Morgan presented an initial version of his 'Big Kahuna' tax idea in December 2009 to the Tax Working Group's final conference. See more here in my report from his initial presentation. Now he has written a book with fellow Gareth Morgan Investments Economist Susan Guthrie called The Big Kahuna that is expected to be released later this month. See garethmorganbooks.com for more details once published. The revised 'Big Kahuna' is for a single tax of 30% on all income, including income from capital, and an unconditional basic income of NZ$11,000 after tax for all adults and NZ$8,500 after tax for all 18-20 year olds. The Comprehensive Capital Tax (CCT) would assume a 6% return from capital, meaning the owners of any capital would have to pay 1.8% a year of the value of the equity in any capital as tax, given the 30% rate. This would replace the various tax rates for income, capital and land. It would also replace all forms of benefits and tax credits, including New Zealand Superannuation, Single Parents Benefit, Sickness Benefit, Unemployment Benefit, Working For Families and Interest Free Student Loans. The plan would be fiscally neutral. The potential biggest losers would be those single parents on benefits and more wealthy pensioners. Others paying a lot more tax include those with high levels of wealth and income. I spoke with Gareth Morgan in the interview above about the proposal, which would be a radical rewrite of our taxation system and a fundamental restructuring of government. There were would be a massive downsizing of the Inland Revenue Department and the Minstry of Social Development, given there would no longer be a complicated tax code or the need to means test and deliver benefits. Here is an outline of the proposal in the book. This book proposes two major changes to the tax and benefit regime that currently prevails in New Zealand – one is to the coverage of the tax regime, the other to the approach we take to welfare and redistribution. Our work looks at the tax and benefit regime in a holistic sense, recognises that the intervention of the State via tax and benefits is about redistributing resources from some in society to others. Do we know what the rationale is for this redistribution? And if so, do we achieve our objectives? These are questions that can only be answered by examining the tax and benefit regime as a whole, an approach that has been eschewed by governments of recent times. Instead governments have chosen to establish taskforces to look at parts of the tax and benefit system only, confined by quite specific terms of reference that have precluded a “whole of system” assessment. For example the 2009 Tax Working Group was directed not to consider Working for Families and the 2010 Welfare Working Group was directed not to consider NZ Super in its assessment of welfare. This piecemeal approach undermines so-called independent reviews of the tax and benefit system and has resulted in us losing sight in large part of why we tax in order to redistribute, what extent of redistribution we deem desirable and whether or not we know whether we achieve those, nowadays implicit, objectives. The first reform we recommend covers an issue that successive tax studies have recommended be addressed by New Zealand governments in order to lift economic efficiency. It is a comprehensive capital tax (CCT) that all owners of productive capital (land, buildings, structures, plant and equipment, intellectual property) are annually liable for, although it can be offset by those that produce a taxable income return in excess of the minimum required of New Zealand’s productive capital (which we set at 6% pa, a rate that reflects the return available risk free, being the average government bond rate over the past decade). Hand in hand with the CCT proposal we alter the income tax regime to a single rate on every dollar of income. All income whether cash or in kind is captured for taxation purposes. This is what the CCT does. The principle of redistribution which loosely accords with the principle of vertical equity (wherein the well-off give proportionally more while the poorest receive proportionally the most) has over recent decades been effected through the progressive income tax regime. But the greatest source of means of the well-off is not income, it is wealth, and that has typically remained beyond the reach of the redistributive machinery. Narrowing the tax base in this way results in progressive tax rates that rise more steeply than they should, and that brings with it all manner of incentives for taxpayers to avoid being subject to such high rates. Over the last few decades the redistributive goals of our society have been reduced to assistance of last resort akin to an ambulance at the foot of the cliff which kicks into action only when a person’s lot has fallen so far below what society deems adequate, that humanity and sympathy emerge. This “hand up” approach to redistribution is grossly stigmatising of people so affected and quite at odds with the original principles of redistribution which formed the philosophical foundations of our mixed market/State economy. The thinking behind that model wherein individualism is championed but subject to the constraint of everybody getting a “fair go” was developed during the Age of Enlightenment kicked off by the early years of the Industrial Revolution and its enslavement of child labour and burgeoning disparity of distribution of benefits. The result was an ethos that held that everyone has a right to participate in economic progress and for that to be a reality the distribution of wealth has to be such that all can participate, the some are not effectively locked out from birth. This view of the world has been marginalised over recent decades, in favour of redistribution on the basis of established need, rather than it being an entitlement for all in a civilised society. In this book we establish a tax and welfare regime that recognises everybody’s entitlement to live in dignity. The second reform is directed at making quite explicit the redistribution objective of the State by paying every adult an unconditional basic income (UBI). Nobody misses out on this bottom line entitlement – it’s the right to a dignified existence that a modern productive economy can provide. This is quite a different approach to at present where the selective assistance from the is based on the notion that everybody who can, should be in a particular form of work – paying work. Aspiring to non-paying work is not recognised in our current welfare system as a legitimate basis for a dignified existence, people who engage in that need to find their own means of support. This, rather primitive perspective on the contributions people can make to their society, hasn’t moved much from the rules of a subsistence economy wherein if one doesn’t produce enough food for the table, one starves. We can agree that each year our economy produces more than enough for us all to eat, be clothed and housed, each year the higher GDP per capita is a measure of the additional surplus generated. This is how far the NZ economy has come since subsistence times where food, shelter and clothing were the sum total of production. The UBI provides that every adult receive enough to eat, clothe and house themselves – unconditionally, this being the universal entitlement to an adequate basic income. The State can underwrite that everybody has this entitlement as a human right. It can raise the required funds from taxes. People then are free to choose to engage in paid or non-paid work knowing their basic living expenses are covered. Unlike today, they are not compelled to seek only paid work because if they don’t have it their mere existence is threatened. With a UBI they avoid the stigma of being unemployed if they can’t find paid work, or the loss of respect society associates with that situation. For example a person may well choose to care for children rather than stand behind a store counter day after day. Who is to say that society values the store job more? Currently the job of caring for children has to be self-funded. In a society that produces far more than required for the basic needs of food, clothing and shelter why shouldn’t a basic income be guaranteed? If nothing else it’s a signal that the society is sufficiently developed for all to live in dignity. It is argued that such an income is already guaranteed, at least to those who cannot find paid work, in the form of the unemployment benefit; to those who can’t work in the form of disability or illness benefits. But what of the person who chooses unpaid rather than paid work? The economy comprises a raft of unpaid occupations – parenting, care of the elderly, volunteer organisations such as sports clubs, artists, creatives and so on. None of these can be done by anyone who doesn’t have independent means – an earning spouse, a benefit, or is paid out of their own wealth. For a society that produces far more than is required to meet basic needs such a restriction on choice seems backward. That the result may be greater output of products and services from the non-commercial society and less from the commercial one, is not an outcome that we should be afraid of. Where is the logic in more and more commercially-based production anyway? The argument that holds we already have this option, that people can opt to withdraw from commercial endeavour now – ignores the reality that such a choice is only open for those who have independent means – a subset only of the population, and a very restrictive one. One of the benefits of being a wealthy society surely must be entitlement of every person to some basic level of income, unconditionally. An effect of this second reform is to deliver a more efficient and equitable approach to redistribution. In theory at least it should make no difference if the State has in place the apparatus to select and monitor those that require a Benefit, or whether the State simply pays everyone a Benefit and claws back from those not in need of it via taxation. Intuitively it would seem the first method would be easiest – and that is what we currently do. But this approach has problems – how do you decide who is deserving, how can you be sure that everyone who is eligible actually gets their dues, how many people do you employ to administer such a regime? The second method guarantees automatically everybody gets the UBI, it then comes down to whether the taxation regime is efficient and effective at clawing it back from those who don’t need it. The administrative overhead of monitoring is no longer required. This book is about a revolution in our tax and benefit system, not the next step in an incrementalist journey of patching up the current regime. As such its ideas will both tread on toes and offer new opportunities – often simultaneously - to the reader. I used to think Gareth was a fairly level-headed guy, but this is just a pile of horse****. And your reasons for your reasoned opinion about Gareth's reasoned opinion are...? ...or is it just a drive-by-shooting of a comment with a swear word that is not-so-cleverly disguised...? Fair comment and sorry for the expletive. I would like to endorse Chris_J's comments below that managed to articulate some of my frustrations much better than I could after watching the interview and reading the post. This plan is so "fair" and "equitable" that it becomes neither of those things at all. Oh, and he should make the book available as a free electronic version so more people will read it - even I might be tempted. Fair enough. Gareth says he will soon have a chapter available for download free. I don't think it's even worth considering the merit of Gareth Morgan opinion pieces, much the same as I don't for Carmel Fisher or Brian Gaynor. These financial personalities are in the press for one reason - to keep people aware of who they are and hope that it is to grow their funds under management. Gareth is a very smart guy - but often times his articles are nonsense and he probably knows it - but that is the price of staying relevant, and making the big bucks. I agree. I used to read and listen to what he had to say with some interest. But not anymore. New Zealand doesn't need a radical (queer, peculiar, bizarre???) overhaul of its governance of this nature, and quite frankly, I'm sick to death of the neurotic Chicken Little's who insist it does. As my American friends would say, they have way too much time on their hands. A lot of New Zealanders have time for Gareth. He speaks well in a way that we can all get what he is on about, explains things well and has good ideas. 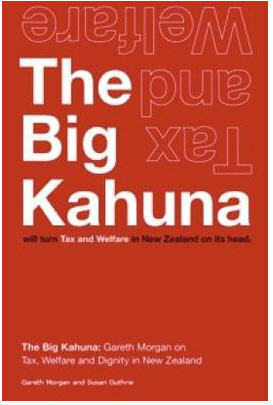 From what I have read and heard so far The Big Kahuna is an excellent proposal for New Zealand. For a very long time we have been taxing 'doing stuff' and not taxing 'not doing stuff' Yet as a society we need people to get out and 'do stuff'. To build businesses, delevop property , to get on with life. But we tax the hell out of that sort of thing and leave capital to move to not doing anything much at all. The real buldger in New Zealand is lazy capital siting back and waiting for a tax free hand out. I think it's a great idea - I've always advocated the dole be paid to everyone - that way there is an incentive to work in lower paid jobs for those who have less qualifications. Okay, so the pay is not great in these jobs but at least this pay (under GM's scheme as I understand it) won't erode the unemployment benefit/ universal basic income. The current system offers no incentive to work in low paid jobs, the more you earn the less benefit you receive. I like it; simple, anti-distortionary, and difficult to rort.A lot of people wouldn't vote for it though; too many vested interests. One problem I see though is that a lot of capital doesn't earn anything like 6% ROI. That might mean that it's mis-priced and I'm not sure how you would revalue without selling. If you sold at a loss, could you claim a tax credit? Isn't it more than just a little unfair to suggest a 21 year old can sit at home on the Xbox while boozing and receive the same amount of money that a retiree who worked 45 years without a break gets?? Considering once a couple owns a house without debt, that they could happily livea simple life on $440pw (without children), everyone would just simply retire early (maybe in their 40s, or maybe at 21!!). Gareth's ideas are simply inequitable, unworkable and a massive incentive to be unproductive. Did the retiree work for free? How do I own a house debt free at 21? I wouldn't quit my job for $210 a week and I don't think many people would. Retirees paid their taxes and are entitled to a pension. A 21 year old doesn't deserve the same entitlements. If you want a debt free house at 21, try Mataura, Kaitangata, Nightcaps, Bluff etc, some have still sold recently in single thousands, but $20-30,000 often gets something quite liveable! Maybe you wouldn't quit your job, but I know plenty of people who would take a "prolonged sabatical" if they were paid a stipend for doing nothing no questions asked. Look at it this way take a single low income worker, say he currently earns $30k for working 47 weeks (5 weeks annual leave), cash in your holidays, work 52 weeks in one financial year so you made $33,200 in the year, so after tax (with the 11k free money) you earn $34,200. So say work 2 years then you get $68,400, take the full third year off and you get $11,000. So the total is $79,400 for working 2 out 3 years. Under current tax laws work 3 years hard slog and get $77,000 after tax. So our single young worker will end up getting more money for working just 2 years out of 3, than he did for working 3 years normally before the "Big Kahuna" - how does that help productivity?? Do the same sort of thing for someone earning $50k, under the "Big Kahuna" they could take 8 months off in year 3 and receive the same income. The problem is that if you make it easy for people to do nothing, they will! Yes people may earn more by working more, but how many would take that option and for how long? Especially when they lose 30% of all that they earn. The $11,000 free money would be essentially the same as removing the retirement age. Many, many people would retire at 60 or even 50 if they had savings, were mortgage free and able to live on $22,000 a year for a couple. Is Gareth really suggesting cutting the pension?? It's currently $27k for a couple (net) and $17,700 for a single person (net). Just another reason why this is so unworkable. Chris_J, I know you're capable of a far more sophisticated analysis than that. I did a research project some years ago to develop a proposal for a Universal Basic Income and discovered that one of the biggest champions of such a programme was Milton Friedman who advocated a Negative Income Tax which bears some similarity to whats being proposed here. It actually had bipartisan support and a large social experiments was conducted between 1968 and 1972. Sadly they were abandoned, mainly due to conservative pressure, after misreported findings contended that the programme led to the increased likelihood of family breakup amongst the African-American "test subjects". "Between 1968 and 1982, the United States federal government sponsored four negative income tax experiments. This paper provides a set of consensus estimates of the labor supply responses to these experiments. It is found that despite the wide range of treatments and evaluation methodologies, the results are remarkably consistent. On average, husbands reduced labor supply by about the equivalent of two weeks of full-time employment. Wives and single female heads reduced labor supply by about the equivalent of three weeks of full-time employment. Youth reduced labor supply by about the equivalent of four weeks of full-time employment." Get on your bike Gareth! I like the plan but there are some big wholes in the numbers and devil is in the detail. I work just 20 hours a week due to health reasons — so I have to make every dollar I earn go far, living in shared accommodation with communal toilets and kitchen in Auckland costs $11,000 per year so that would be all of my after tax income taken care of and I wouldn't be able to eat — so I'm saying the bottom line isn't high enough. The role of government is to redistribute wealth not only to give the needy a hand up but also because it's healthy — in America for-instance where 10% of the country own 70% of the resources clearly they have problems with the wealthy creating policy in their own interests at the expense of their citizens who are all unemployed. By redistributing wealth to the disadvantaged you have a strong middle class whom benefit from their spending and this has great benefits to society as a whole. If Mr Morgan takes tax including from capital sorely the tax take will increase therefore the redistribution chain also needs to expand. The one thing I do find interesting is fiat currency and inflation, it's all well and good to claim 6% interest is possible but when you tax the return prior to taking inflation into account it is easy to imagine a situation where people are losing money and I think it important to be a nation of savers. If we went away from all money being created through interest this would be of benefit but what are the chances of this happening? Also in NZ we don't seem to hear much to do with Carbon Tax from the global warming scare mongers but it's a real issue in Aus where does this fit into the equation? "It is a CGT that all owners of productive capital (land, buildings, structures, plant and equipment, intellectual property) are annually liable for".....and stage two of this Kahuna Cubanism will involve the state deciding that a person's capacity to create using their brain shall be taxed!......afterall it is only fair and just that the gifted pay more...and if intellectual property is to be regarded as Capital...why not intellectual ability....! I pretty much always agree with what Mr. Gareth says. But did he say his CGT would apply for owner occupiers of their house? IMO my home would not be capital, it's a durable consumer good. Only in a pyramid scheme bubble economy like we are in now is a house return generating "capital". Pls get him more often for interviews Bernard, Gareth calls it like he sees it. Any such tax system would have to be decided and implemented by an independent commission not influenced by party politics. Otherwise those with special interests to protect would hijack it and it would morph into some frankinstein. I have no time for anyone that makes and keeps a fortune due to current tax laws and then suggests changing it for everyone else... put your $ where your mouth is and make a donation to the IRD Gareth..
How do you reform social welfare policy in N.Z. and rebalance the inadequacies under those policies while maintaining no less promoting an "entitlement mentality". This is the core issue for me...we enshrine and nurture entitlement thinking as a measure of our sophistication as a society to our own detriment.....all the while those who pass legislation go beyond and see it as the staple vote net...not to mention most benificaries will spend every penny they lay hand too.......and the legislators think now "where's the harm in that". P.C. behavior on a National scale has been the real license to steal....dwarfing ETS or anything like it. I think we all need to grow up a little and say when enough is enough. "How do you reform social welfare policy in N.Z. and rebalance the inadequacies under those policies while maintaining no less promoting an "entitlement mentality"." Christov, everyone in a democracy has an entitlement mentality, as people harbour an illusion that the government is meant to serve the public good and since they pay taxes and vote they feel entitled to benefit from the application of its power. The wealthy feel entitled to the legal machinery and public infrastructure that facilities their commercial activities, the middle class feels entitled to the generous health and education system provided by the public sector, and the poor feel entitled to the governments safety net to support them in case of misfortune. But there are tradeoffs for everybody. The wealthy, if they're unable to evade the taxes, pay large amounts of tax, the middle class pay high proportions of their incomes in tax, and the poor are subject to the stigma and degredation of putting their hand out to collect welfare payments and effectively trapped by high effective marginal tax rates should they return to the workforce where the new job imposes new costs and pay little more than the dole. Anarkist...appreciate your response on the matter...but believe me I am not deluded in any way when it comes to N.Z's overkill of the welfare policy. When welfare becomes a career choice for those deemed impoverished, albeit a trap they walked into ,it demonstrates failure on the part firstly on the individual...the education ...the system to recognise it. I have occassion to work in voluntary help with many of these individuals (benifit by choice) where three generations numbering more than four children per offspring have never....had ...a job...while thier literacy extends filling out the required documentation,which they do faultlessly ,thanks to those who came before them. i have listened to many of thier conversations and come to realize...they actually believe they are entitled to continue if they so choose...because it's not like it's your or my money...it's the Govt's money..the big stupid faceless machine that gives out the money. This is an indictment on the system to recognize the shortcomings of policy designed to do what exactly.......? Define Ligitimate member of society. Once again thank you for your response on the matter. "I have occassion to work in voluntary help with many of these individuals (benifit by choice) where three generations numbering more than four children per offspring have never....had ...a job...while thier literacy extends filling out the required documentation,which they do faultlessly ,thanks to those who came before them." Is it any wonder that so many languish on the unemployent roles in the wake of society abandoning its goal of full-employment of its working age population? And worse, economic discourse is replete with austere and dismal pronouncements that unemployment is the unavoidable byproduct of low inflation. Some pointy headed nerds in Treasury even go so far in proclaiming that there is an ideal level of unemployment, below which will only inevitably lead to high inflation. Throughout the 1990s, this NAIRU was set at 6%. "However, in the short-term the “Phillips Curve” suggests that a trade-off between inflation and unemployment exists so that if the rate of unemployment falls below (rises above) the NAIRU, inflation will rise (fall) until the rate of unemployment returns to the NAIRU, and then inflation will stabilise at that permanently higher (lower) level." How can one justify the slander and vitriol heaped on beneficiaries, when "society" decrees a certain percentage of the population must suffer their fate? Yes I am only too aware of the degrading impact of the welfare system such as it is, but its an indictment of our wider society, because it entraps people in dependancy. Not just dependancy in terms of an income, but dependancy in terms of not equipping people with the means to meet their own needs. Who amongst the population outside of the construction industry are capable of building their own shelter? Or producing their own food, or making their own clothes? Who even has the means to do so? Sufficient land is the major issue, but also the skill, and the materials? Do you think that would be a concern of the Ministry of "Social Development"? Or is their sole mission to ensure a plentiful supply of ready cheap labour for the "market" when it needs it? There are no distinctions between an il/legimate member of society. We are all part of society whether we like it or not. We are all bound by the same rules (laws), social conventions, norms, and expectations. This is why I'm an anarchist, because the way our society is structured, is to favour the already powerful and wealthy with a few crumbs thrown to the less fortunate, and the primary beneficiaries won't even acknowledge the degree to which the system is skewed in their favour. "Yeah we mean an economy that’s been growing very strongly, actually we've almost been over 3% growth for five years now, that’s a really strong record of economic growth and it's a very good sign for an economy, but at the moment we're starting to see in our business surveys and our other surveys and other data that we have got businesses who complain they can't get staff, they're having to pay a lot more for them,...'ve got unemployment right down which is again very good, it's as low as it's been for 14, 15 years but actually that also means that the labour market is now very tight as well and when that happens an economy is effectively running hotter than it can afford to" Alan Bollard. By what measure is it fair for a pointy headed glorified bureaucrat to determine what the rate of pay for workers should be? Its patently obvious that the business community is comfortable with government intervention when its in their favour. Surely a solution to high wage increases is investment in productivity improvements to increase the efficiency of the workforce or to increase the value of their work. No its far easier to complain to the Reserve Bank Governor that the workers are getting uppity so they need to hike interest rates and give management an excuse to get rid of a few workers. Surely executives aren't dumb enough to call for interest rate hikes when it actually harms their business would they? Or don't corporate executives even care about the actual profitability of their businesses anymore, just the share value on the sharemarket? You would think that needing to fire at least six thousand employees is a poor indicator of a company's financial viability, but its belied by the example of Cisco in the United States. Cisco Systems Inc. (CSCO), the largest networking-equipment maker, plans to eliminate about 6,500 jobs, or 9 percent of its full- time global workforce, to help trim $1 billion in annual costs and step up profit growth. So the aim of the exercise Gareth, is to downsixe the tax department. Well fair enough, there are good reasons for doing that. However, progressively removing capital assets from those that have worked hard to amass them removes the incentive to save and invest. That will result in a continual underinvestment in assets and capability, leading to everybody being equally impoverished. Well done comrade. At least this will remove the wealth gap. OK lets think through some examples of how this may work and how people may react. 1 A buisness with $100 M to invest. This would face a period of some years before the enterprise was established and returned a full profit, but it would have to pay tax regardless. Long term what would this return be. One would hope for better than 6% but what is actually achieved normally. Average dividend yeild on the NZX is high at the moment at 4.3% before tax. This tax does not seem to offer encouragement for the risk taken. The money may be better invested in the bank, properties or buying other higher yielding companies. I prefer a CGT taxed at the full rate and inflation indexed to deal with the problem of speculation and inflation farming. Only the after inflation portion of interest would be deductable for borrowers, and for lenders, only the after inflation portion of interest would be taxable. Given a choice I would tax speculators at a higher rate than productive labour and enterprise. 3 The low or no wage person. The benefit poverty trap is removed so that is great. Some of a cynical disposition may say that many of these people are slackers and will just sit back and do nothing on the social wage. For some this will be true but I have more faith that if real opertunities are available, people will take them. The falling unemployment rate during the labour Govt demonstrated this. Who really wants to live at a subsistance level? 4 High earning individual. A flat tax rate will encourage him to earn more, great. The accumulating capital will become a tax problem so I suspect that a lot of effort will go into avoiding it. Eg investments may become distorted so that they appear to lose value, but in reality do not. An industry will grow up arround this problem. Summing it up I like it for the salary and wage earner aspects but think it does little to prevent the speculation disease or encourage productive investment. Anarkist.....Cheers for the considered input. sorry Neco ...I was exausted reading it.....suffices to say i don't think we were on the same page...I.e. ideology as opposed to street level contact. Dude, in actual fact, I do have street level contract. I have been there myself many times. Its whats driven me to explore the reasons why the world is as it is. I've lived at the margins my entire working life. I know what its like to live at the very bottom. I know personally how corrosive the welfare system is on the soul. How degrading it is to need to apply for a benefit, a food grant, or an accomodation supplement, which feeds and houses, but goes straight to the supermarket and landlord. The nature of the current labour market for those at the margins is insecurity and casual employment. People have to shape their lives around the cyclic nature of the "market". The unfortunate fact that those with the responsibility of managing our economic affairs don't even understand the system that they preside over and those elements that they do, they use their "levers" to meet narrow objectives, without regard to the harm it does to others. Take the inflation debate for example. Even faced with evidence that conflicts with their theories, they still unrelentally hold onto them. "Three years ago, every advocate of the natural-rate doctrine firmly held that unemployment below six percent would spark inflation. Unemployment has since fallen, but contrary to theory it not only has remained below the supposed natural rate but has failed to touch off inflation. The Friedman/Lucas arguments have received a clear empirical rebuke." Yeh I'm sure Bollards interest rate hike in July 2007 had absolutely NOTHING to do with the recession that the country slid into in 2008. Or the collapse of the Finance Companies. Just shows him to be a joke. "I can understand why Bollard wanted to lift now, Cullen threatened his manhood and Bollard had to show he had some balls. I still think this lift is unnecessary, house sales are easing and firm profit margins have recovered, easing inflationary pressure over the next few months." Anarkist....thanks again for your thoughtful response....had not intended to draw such a defensive posture...but in context understandable. For what it is worth coming from dirt poor is no stranger here either...but we've all heard the story right..? I help out because I believe in the genuine cases....I no longer champion the lancing of windmills as they just go round n round n round n round....I'm sure you must have come across em in your considerable experience. If I had more time, I would at some point like to get into it with you "ideologically speaking" but as I pointed out in recent threads...I'm struggling to stay above water at the moment myself.....with having to let people go I've come to know and care about I'm finding myself a bit preoccupied......but I guess you'd realize things are not always within our control. I didn't mean to come across as being on the defensive. I guess prefacing the comment with dude may have given that impression I suppose, lol. Much kudos for helping those who're less fortunate than yourself. Better a hand up than a hand out. Better than the "charity" laced with middle class condescension from WINZ. I don't expect an ideological exchange, because I believe its fruitless and I don't expect to convert anyone to my worldview. I would prefer putting my values into action, but I've found that its a difficult proposition for someone of my humble background. I'm working on taking some time away from New Zealand with its frustrations and disenchantment. Healthy I think. I'm sorry, I haven't kept up to date with your recent story, because since you've noticed, I like to put alot of time into my own comments so I don't get time to trawl through every post on the site. I hope everything works out for you and doesn't get you down too much. Best of luck ...travel well and enjoy Anarkist. Maybe....Bernard ..just maybe...you should hum a few bars of "Don't stand so close to me" when around Gareth....seems that Quixote Syndrome might be a little catchy..! Gareth Morgan says: It is a comprehensive capital tax (CCT) that all owners of productive capital (land, buildings, structures, plant and equipment, intellectual property) are annually liable for, although it can be offset by those that produce a taxable income return in excess of the minimum required of New Zealand’s productive capital set at 6% pa.
Can someone please explain how tax works and the 6% offset works? Some examples? Is cash in the bank, term deposits, bonds and debentures considered capital? Not 100% sure. But I think what he is saying is you are taxed at the greater of 30% of your taxable income or 30% of 6% of your capital invested. Essentially he is saying you over-paid if you are not earning a return which is greater than 6% of your capital as you could have bought Government bonds which would have paid 6% and you would have been taxed 30% of this. This forces a more accurate pricing of assets and people will look at the income stream of those assets to work out the price they would pay. It would have a significant impact on land prices and cause them to fall substantially when first implemented, but would make it harder for them ever to get masssively out of line with the rental return or the productive return in the case of farm-land. Politics is all about the art of the possible. Morgan ain't no poltician, because he certainly doesn't have that art . Bottom line he's just another academic commentator trying to impress himself and any others he can impress as well. I still can't see how a CGT is of any value in a contracting economy. Value? Interesting concept. It's a national liability. It's more to do with wedge politics and political gestures. The MOST important thing is to decide "what the real problem" is. It would appear the real problem is NZ investment is overwelminlgy skewed towards property investment, to the point of substantial mis-allocation of capital and resources. The solution to the problem is to dis-incentivise it. There are three fiscal approaches available to government. The weakest is a CGT. Gareth has not done his sums very well indeed. How anyone could "have their basic living expenses covered" on $220.00 a week I do not know. Currently a super-annuitant living alone receives $339.92 a week. I do not know how many pensioners there are who have no other income but there would be a few. What about those solo Mums who have three children and whose husbands have disappeared or died. Even if Gareth gave everybody with children a Family Benefit of $3000.00 pa per child and if each father gave $3000.00 per child out of their $11000.00 (as I believe he has suggested) that means such a mother would receive at the best scenario $557.69pw. Out of that they would have to pay electricity, phone AND rent before food, clothing school fees etc etc. NZ would have even a worse underbelly of poverty than it does now. And we do not want any more drastic changes which would just cause even more chaos. Let's not throw out the baby with bathwater yet again. Just let's make work but we already have. $220 a week for a single person is completely do-able. Plenty of students manage. I can provide some figures if you like. I agree it would be tough in the other situations you describe. However, tough is surely how it should be if you've made some poor decisions? Yes I agree, students can manage because they are at the beginning of their life and they have and see potential. But those I described are in a terrible place and to say that they have made bad decisions is a wrong thing to say. Life throws some dreadful curlies and not everyone can cope and at society that is prepared to throw those people on the scrap heap is not an admirable one. What is you got Parkinson's before you can accumulate anything? That is not a decision that anyone makes. I agree Patricia. What is the point of tax and a welfare system if not to support those who really need it? IMO the important thing for NZ is to improve the systems that identify the people who truly need support from the state and those that don't. A good first step would be to means test the pension - my parents definitely won't need it in a few years and the money would be better used elsewhere (or not at all!). Well..since you're interested...the point is the welfare system guarantees pollys a place at the pig trough...so in a way it does support those who really need it...because they are otherwise unemployable! A really dumb step would be to means test the pension...as has been explained many many bloody times before. So tell me why my parents should get the pension? They don't need state support... It's basically a guaranteed dole for old people. Interested, the NZ superannuation system is regarded as the best in the world and very cost effective. Australia has a means and assets one and has an army of civil servants to assess people's eligibility. The cost, because of that, is a approximately the same. When the tax rate was 66% the rich regarded it as their right. Perhaps you parents could donate it to a charity. Re-reading what I wrote, it may have been a little harsh. However, there is a big difference between getting Parkinson's and having kids you can't afford. Getting Parkinson's is not a choice, having kids is. As I watched the Gareth Morgan Video interview it was SO reminiscent of Roger Douglas in his prime selling the GST. Same buzz-words, same convictions, same passion etc etc etc .. really, if you closed your eyes and just listened to the words you would have thought you were listening to a replay. I welcome fresh thinking. I have yet to see where discussion of new ideas is harmful and I like working things out from first principles every now and then. With this proposal as I understand it I would worry most about the incentive effect. Saying it is revenue neutral under the current set of incentives does not say much about what revenue there would be under this regime. For instance, if 50% of kiwis decided that they could happily opt out of commercial work, move to the country (or beach) and subsist on a vegetable garden and $11k/yr ($22k for a couple, $44k for a couple of couples) how would the remaining taxable private sector workers pay for all the existing government services taxed at only 30%? Either rates go up (and more people drop out) or services go down and we are all worse off. Also, I'm wondering myself how long I would have to work and save to achieve a capital base that would pay me $11k after tax at 6%, ie. $262k. If I worked to earn $22k but it cost me $11k to live (and it would probably cost more without the time for fishing, gardening, etc), my after-tax savings would be $4,400. Neglecting compounding it would take me 60 years to accumulate savings that would earn me more than the $11k I get right now anyway for fee. Why not just drop out now? One of the most interesting practcial suggestions/points is the need to look at tax revenue and spending at the same time, not in separate constrained working groups looking at welfare, pensions, some taxes, child poverty etc.. Interesting thread, but a coupla small points to cogitate over, chaps and chapesses. Nowhere is the link with the existing land tax system (Local Gumnut Rates) explored or mentioned. I'd just love my massive $171k LV to be taxed at 1,8%, cos that's - um, counts on fingers - $3,078 - about 150% of the present entire Rates bill. But 'wiping the IRD' and taking a holistic view, means considering the role and rapacity of LG as well. Don't see any thought along those lines. the re-description industry, which thrives on tax rates based on easily avoided classifications. 'Why, Inspector, that there rack of Servers is merely my Multi-Media Maxed-out Machine for facetwitting'. It's a Toy, not Productive Capital. So the productive energy released by the demolition of MSD, IRD and LG, with the consequent flood of public service drones onto the jobs market, will be very likely equalled by the rise of the lawyers, accountants, asset valuaterators and invoice finaglers, necessary to describe Productive Capital in that careful Legal manner we will no doubt demand, prior to taxing the living pee out of it. Which raises the final point. Waymad: Where does Gareth Morgan use the term "Productive Capital". Watch the video. You will see he includes the family home in his definition of capital. He's interested in capturing "lazy" capital that isn't productive. Snarlypuss: Where are you when you are needed? You could address "interested's" concerns. If your old man is still in his family home and it's worth $500k he will be assessed at $30k deemed value and taxed at 30% for a bill of $9,000 and his pension of $11,000 will just cover it. Has Gareth really thought this through? Say I have $1m capital earning $150k annual gross income with $70k expenses. With his 6% capital income thingey is he saying that you pay tax on $60k income and can deduct $70k in expenses? Because that is just absurd. Or is he going to tax twice? Once with the capital tax and again with the income tax? Then you ask the question, what if I put my capital in one of Gareth's actively managed funds and the gains are taxable. Then if he loses 20% of my capital do I pay tax as if I made a 6% gain and the losses aren't deductable?? What if I buy a Ferrari, do I pay a tax on capital value even though it's value is consumed? What if that's just a $15,000 Toyota, do I pay declare $900 a year in income even though it's value is consumed?? What if I buy some antique furniture, or art?? Or how about a box of weet-bix, do I pay 6% of it's capital value because it's siting in the cupboard on tax day?? Where do you draw the line? If the family home is included then the value of the new kitchen is taxed as unproductive capital even though it is something that is depreciating in value and in effect being "consumed". He is also suggesting that we in effect remove the retirement age - effectively lowering it to 21!! How is any of this productive? How do these changes reduce the need for the IRD? Someone has to determine the value of capital. Most importantly, how are the capital gains/losses treated? Or is property the only thing Gareth is fixated on and he hasn't considered all forms of capital? Bernard, read the book, give us a summary, because I don't want to waste my time reading a lot of drivel! This is a sledgehammer to crack a nut. If the sledgehammer was used on at least two of the elephants in the room things need not get so complicated. Elephant One - deal with nil effective property/capital+gains/land taxation - in the "blindingly obvious" ways we keep avoiding - to deliver a broader lower flatter rate system. Elephant Two - having made the tax system more balanced, ditch the welfare warps that are in place to cope with our presently warped and unbalanced taxation system. Plus stop incentivising welfare recipients to require yet more welfare - it's not meant to be a lifestyle choice, it's meant to help the vulnerable, not the lazy. Don't expect to find the political will to develop 'The Big Kahuna' if it cannot be found to deal with our wee herd of very domesticated and comfortable elephants. Nice idea, I like many aspects of it, but the problem isn't one of functionality, it's one of nil will and leadership capability - and this deficit will stop anything happening. Sad eh. "Your annual net income would change by: -$2,335 Oh no, you'll be worse off. But others won't be!" The Big Kahuna ... Yeah Right.